PURE's Online Certification Program is the first of its kind, allowing stylists to take the education online eliminating the need to travel to a class and allowing the stylist as much time as needed to complete the program. Plus, access to the online program does not expire so the stylist can revisit for a refresher. Taught by the world renowned Vivienne Mackinder, the online program consists of a series of exercises that must be completed for certification. Instructional videos on cutting, styling, and more are included as well. The program has an introduction to the PURE Radicals, along with some amazing styling techniques from Vivienne. So just a few hours after logging in, the stylist can look to benefit and profit by offering one of the most sought after services in the industry. Simpler, faster and better...PURE Extensions. 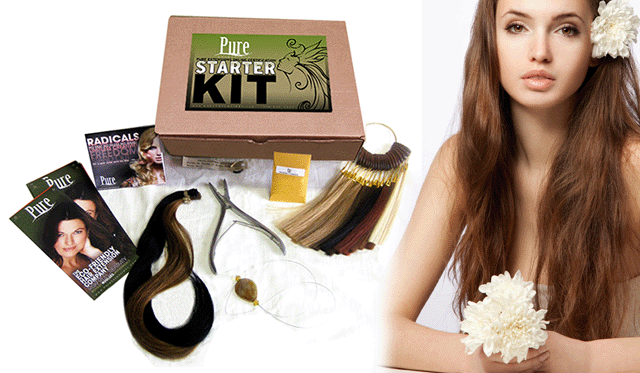 The PURE Starter Kit has it all! It contains the tools necessary to begin applying PURE Extensions along with access to the Online Certification Program. After only a few hours the stylist can complete the program and become certified to apply PURE Extensions...it's as EASY as that! Please call us with any questions 310-656-7873 or email us.